It’s no secret that a clean office space is a happy office space. Routine office cleaning increases productivity, maintains a healthy working environment, and portrays the high standards that you hold your company to. Advancing your office image and giving your employees a more comfortable environment to work in, office cleaning services are a no brainer. Dust-free counters, grime-free bathrooms, organized conference rooms, and a waiting room so tidy you begin to wonder if your clients are only coming in to check out your fresh space. Okay so maybe that’s a stretch, but really, who doesn’t love a clean office? If you could come to work every day and see everything in its place without a crumb on the floor, the way you thought about getting up at 6 am may change. As nice as it would be, having professional office cleaning services every single day just isn’t realistic. Although we would be more than happy to come to your office every day of the week, we understand that’s just not practical; you have things to get done and places to be. But you don’t have to drown your sorrows out and dwell on the fact that we can’t greet you every morning with a fresh cup of coffee and a spotless floor. There are things you can do to keep your office in pristine condition in between our visits, ensuring that you get the most out of our office clean. 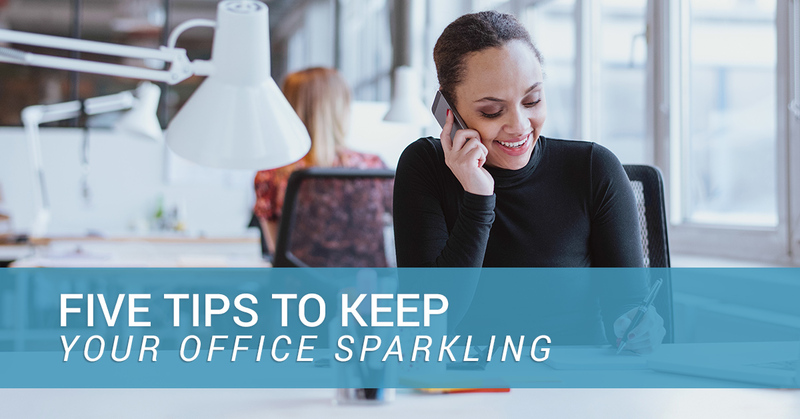 Stay on top of your office’s cleanliness. With these five tips, you can feel good about the environment you present and worry a little less about what is lurking in the corners before we come. After Geralex Janitorial Services has come and gone, one of the most beneficial things that you can do is encourage your employees to stay organized. This may require you to buy more filing cabinets, pen holders, mail bins, and drawer organizers helping to eliminate as much scattered items as possible. Keep in mind you are not asking your employees to leave their belongings at home, but rather, you are giving them the opportunity to store what they need in a neat and efficient manner while making it easy to find what they need when they need it. Everyone likes a clean bathroom. While we will make your bathroom spotless, you can keep it tidy with a regular touch up. Using generic disinfectant sprays, wipes, and cleaners is a wonderful way to stay on top of your restroom cleanliness and give your employees the sanitary space that they deserve. When it comes to cleanliness in the office, electronics are often overlooked. Accumulating a large amount of dirt, dust, and grime, it’s essential that you provide your employees with the necessary tools to maintain the cleanliness of your office between our office cleaning services. Things like microfiber cloths, compressed air, and rubbing alcohol are safe and effective cleaning solutions that will help the dust stays at a minimum until we come. To ensure that your office stays in tip-top shape, you will want to take the trash out daily. Emptying your waste baskets regularly will reduce those lingering aromas, and lessen the chance for germs and bacteria to spread throughout the office. Removing trash makes the office look nicer and feel cleaner, it’s that simple. The break room is one of the highest traffic areas in the office. Tidying the break room at the end of the day ensures that our work does not go to waste, giving you and your employees a clean and safe place to store and prepare food as they step away from the hectic work day. To make sure the break room stays clean, ask your employees to wipe down the counters, remove all old food from the fridge, wash their dishes, and stack chairs and tables when necessary. With routine maintenance, your office can stay in pristine condition. And when you need that true deep clean, you know who to call. To ensure your office is as clean as you want it to be, give us a call. We are more than happy to help.